United is offering a 30% bonus when you convert hotel points into United MileagePlus miles until 30 November 2017, up to a limit of 25,000 bonus Miles. Converting hotel points into airline miles is usually poor value. If you stay at hotels regularly, you’re generally better off maintaining your points balance to redeem on free nights, especially if these points have been earned the hard way. However, there are some ways in which you could take advantage of the current promotion to ‘buy’ some cheap United MileagePlus miles at rates less than what you could buy from United directly. Registration is required for this promotion, which you can do here. Below are a few of the ways in which you could increase the value of this conversion offer. 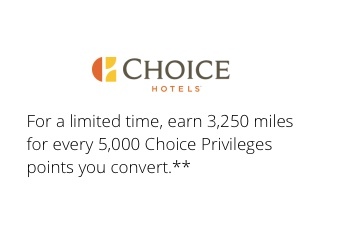 Choice Privileges is the membership program for brands like Comfort Inn, Quality, and Econolodge. You can purchase 50,000 points with this program per calendar year, for $550 USD. Until the 12th November, you can receive a 30% bonus on any points purchase. Choice are also running a simultaneous promotion for the month of November where 5,000 points convert to 2,500 miles, instead of the usual 1,000 miles. United will then add 30% bonus on top of this, for a total of 3,250 miles. This offer therefore gives you the ability to ‘buy’ 42,250 miles for only $550 USD, or 1.3 cents USD per mile. 1. You can buy 50,000 Choice Privileges points for $550 USD, and you’ll receive 65,000. 2. 65,000 points will convert to 32,500 United Mileage Plus miles. 3. With the 30% bonus, you will receive 42,250 miles. United sell their miles sell at 1.88 cents each (USD) under their once-in-a-blue-moon 100% bonus miles sales, so this is an incredible way to purchase cheap miles, even despite their recent devaluation. A Business Class redemption between New Zealand and Australia on Air New Zealand only costs 25,000 miles, so ‘buying’ them in this way is the equivalent of purchasing a Business Class ticket for $325 USD. Starwood Preferred Guest let you purchase 30,000 Starpoints, per calendar year. Until the 29th December, you can receive a 35% discount on any points purchase. Converting Starpoints into airline miles directly usually represents great value, because they generally convert at a 1:1 ratio (with a 5,000 point bonus for every 20,000 points transferred). However, that’s not the case with United MileagePlus, where Starpoints only convert at a 2:1 ratio. Thankfully, Starpoints convert into Marriott Points at a 1:3 ratio, where they can then be converted to United MileagePlus at a better rate. You can buy 19,000 Starpoints for $432.25 USD. 19,000 Starpoints will convert to 57,000 Marriott points. 56,000 of these Marriott points will convert to 25,000 United Mileage Plus miles. With the 30% bonus, you will receive 32,500 miles. This means you are effectively ‘buying’ 32,500 miles for only $432.25 USD, or 1.33 cents USD per mile. Pretty much the same price as the Choice Privileges promotion – though this one continues through to the end of November. Kiwis with either an American Express Platinum Charge or Platinum Edge can convert their Membership Rewards Points (MRP) to United Mileage Plus miles using SPG and Marriott. MRP convert to SPG Starpoints at a 1:0.33 ratio. These then convert into Marriott points at a 1:3 ratio. This gives each MRP an effective value of ~1 Marriott point. 57,600 MRP will convert to 19,008 Starpoints. 19,000 Starpoints will convert to 57,000 Marriott points (you must transfer Starpoints in increments of 1,000). 56,000 Marriott points will convert to 25,000 United Mileage Plus miles. This effectively gives you a ratio of 1.77 MRP : 1 United Mileage Plus mile. Amex warn that transfers of MRP to Starpoints can take up to 14 working days. Generally it is quicker, but to be safe, this means you’d be wanting to take advantage of this conversion method sooner rather than later, if you want to use in conjunction with United’s 30% bonus miles promotion. Starpoints convert to Marriott points instantly, so once you have these, the process should be quick from there on. These conversion offers are usually poor value, though this one seems to be the exception. The ability to ‘buy’ United MileagePlus miles through Choice Privileges for 1.3 cents each (USD) offers exceptional value, either for a top-up, or for flights to Australia or other destinations in Oceania. 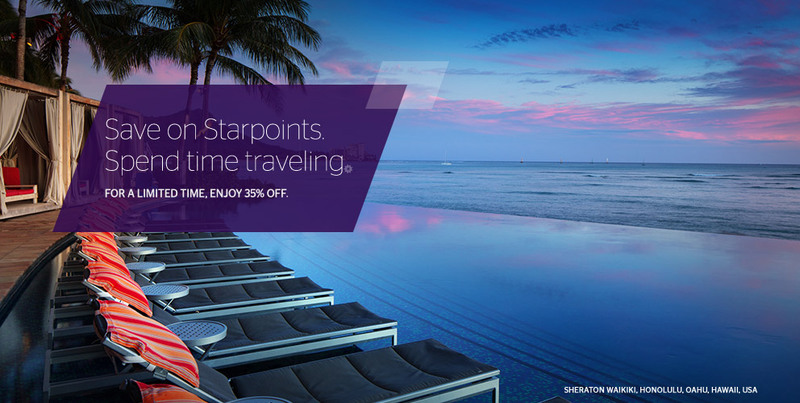 If you miss out, purchasing SPG Starpoints under their current 35% discount promotion and then transferring to United MileagePlus via Marriott offers similar value for the remainder of November. You could also take advantage of the current offer to boost the power of your Amex Membership Rewards points, though you would have to be quick. Remember, point devaluations can be introduced with or without notice, so you should only convert your hotel reward program points to a specific frequent flyer program like United MileagePlus if you have a specific redemption in mind.